If you have kids you have or will be faced with the Tooth Fairy at some point in time. For us, we are smack in the middle of the Tooth Fairy farce. We've been here for almost 2 years I think. Maybe? Anyway...in our house Mr. Mayer is the Tooth Fairy. We have had the discussion on how much to pay out per tooth. Apparently my suggestion of $.25 was silly. We are about 4 or 5 teeth in to the gig. Things have been going smoothly. Mr. Mayer waits until we go to bed because by then Diva is sound asleep and never knows anyone was there. We were smug thinking we had this thing down pat. Then last night happened. We were getting ready for bed. Diva had written a letter to the Tooth Fairy. Me being awesome wrote a response from the Tooth Fairy. I sent Mr. Mayer upstairs with money and note in hand. Then he runs back downstairs with a look of panic. He totally got busted. Diva's door squeaks a little. She woke up when he opened it and said "Will you close my door Dad?" Doh! Mr. Mayer said the he played it off and told her he was just checking to see if the Tooth Fairy had come yet. Yikes! So, we waited an hour and Mr. Mayer went upstairs again. And totally got busted again. He said he sat down and chatted with her for a minute and made the switch while they were talking. Ahhh!! He ended up grabbing the tooth pillow, note and everything else laying around it and left the money and response note in it's place. He was convinced that he had ruined the magic of the Tooth Fairy. This morning she got up and didn't have a clue that she had even talked to her Dad last night. Whew! However, she did point out that the Tooth Fairy took the tooth pillow. 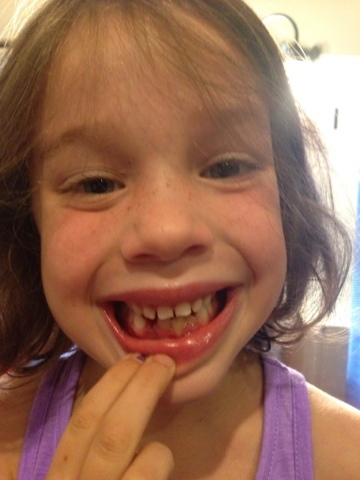 I think the Tooth Fairy will be "mailing" the pillow back to her. This Tooth Fairy business is a lot of work and stress! Sheesh! !